According to research by the American Economic Association, businesses make an average of $2 in revenue for every $1 they spend on AdWords. Of course, results vary from business to business, although all businesses want to increase their returns. However, many of them spend money on AdWords without knowing which search terms to target, what the best bid price is, or how to measure their revenue. The following table shows the typical type of data that a business will collect around its digital marketing via AdWords. How do you know whether you are getting a reasonable marketing ROI on your Google AdWords ads? If you attribute sales only to direct clicks, you may underestimate the value of your AdWords ads. If you use last-click attribution, you may overestimate the value of certain AdWords ads and underestimate others. The value of a Google AdWords ad is the profit from the sales it generates. 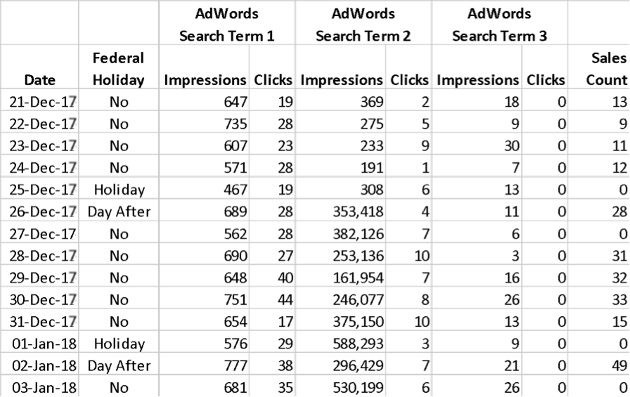 To estimate the value of your ads, you need to understand the relationship between AdWords impressions and clicks to your sales. You need a predictive model that finds the complex patterns in your marketing activity that ultimately drive your sales. Lendcorp knows that those AdWords terms are bringing in sales because when they switch off any of them, sales start to drop. Some of their customers have told them that they saw Lendcorp's paid-search ads a few times but didn't click on them, but nevertheless those ads affected the customers' decision to come to Lendcorp and apply for a loan. 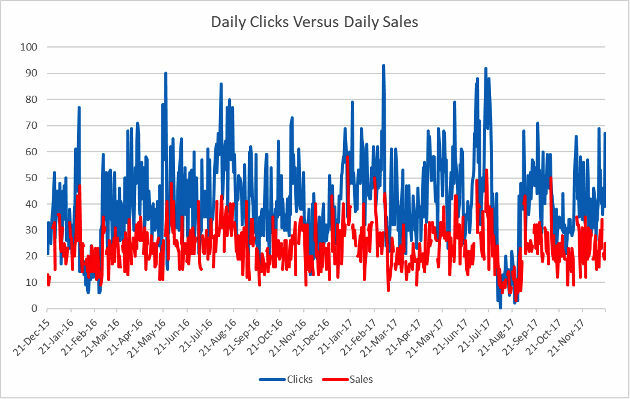 The team at Lendcorp created a plot for daily clicks vs. sales in Excel, and they can see a pattern: When clicks are high, sales over the following days tend to be high. But Lendcorp doesn't know which AdWords terms and ads are driving sales, nor what the optimal bid price is for each AdWords ad. Since there are delays between AdWords impressions, clicks, loan applications, and loan approvals, Lendcorp needs a predictive model that allows for time delays. That type of model is known as a time series model, and the prediction for a particular day depends on the values across a range of historical dates. The end goal is a model that predicts daily sales based on the impressions and clicks over the previous week. The following plot shows the daily sales predictions for Lendcorp. You can see how the predictions correctly move higher or lower in similar patterns to the sales. All that remains is to see what happens to future sales when impressions and clicks are higher or lower. If for every two additional clicks on "fast loan approval" predicted sales increase by one, then congratulations: You have achieved the results of an average AdWords user! In this example, even though "affordable personal loans" brings in more sales than the other two search terms combined, it has a negative marketing ROI. That's because this search term is priced too high for the sales it generates. The cost per sale exceeds $30, which is more than the $20 profit from a sale. If Lendcorp's target marketing ROI were 30%, then the maximum bid price for "affordable personal loans" should be only $3.60, less than half the price of nearly $7.37 that Lendcorp is currently paying. On the other hand, Lendcorp is obtaining excellent returns on "licensed lender" because people seeing that search term are applying for personal loans without clicking on the paid advertisement. Building these predictive models may seem difficult and time consuming because, historically, they were built manually by teams of analysts. But that has changed with the artificial intelligence (AI) revolution. Now, a new technology called "automated machine-learning" means an expert system looks at your data, automatically finds the historical patterns, chooses the most accurate algorithm, and builds it for you. Instead of waiting weeks or months, you can have a model in less than an hour. DataRobot invented automated machine-learning. Contact us for a live demonstration of the Lendcorp example and see how easy it is both to link AdWords activity to sales and to measure marketing ROI.